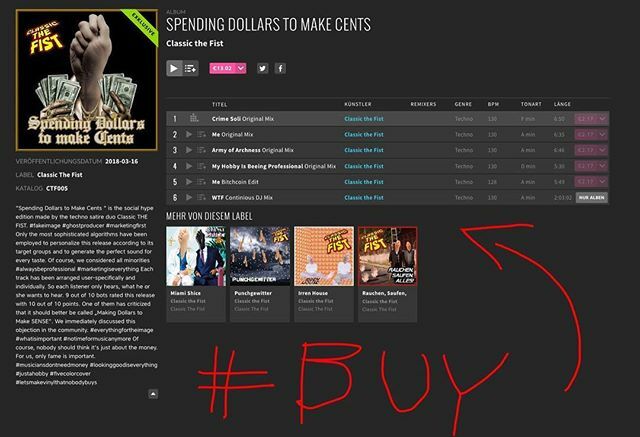 „Spending Dollars to Make Cents “ is the social hype edition made by the techno satire duo Classic THE FIST. Only the most sophisticated algorithms have been employed to personalize this release according to its target groups and to generate the perfect sound for every taste. Of course, we considered all minorities Each track has been arranged user-specifically and individually. So each listener only hears, what he or she wants to hear. 9 out of 10 bots rated this release with 10 out of 10 points. One of them has criticized that it should better be called „Making Dollars to Make SENSE“. We immediately discussed this objection in the community. Of course, nobody should think it’s just about the money. For us, only fame is important. ZurückVorheriger Beitrag:… 2007.. WOWNächstesNächster Beitrag:lets make some sounds on the legendary Korg 770……..